Earlier this year, the ISPCA launched a nationwide campaign calling for the use of performing animals to be halted. THE GOVERNMENT HAS said there are no plans to ban the use of wild animals in circuses in Ireland. People Before Profit/Anti-Austerity Alliance’s Paul Murphy asked the Minister for Agriculture, Food and the Marine Michael Creed if he would support a national campaign calling for the banning of animals in circuses. The minister said conditions under which circus animals are kept and managed come under the scope of the Animal Health and Welfare Act 2013 which he said contains rules relating to the welfare of all animals. “Officials from my Department have met with representatives from circus groups and with animal welfare organisations and with colleagues in the Wildlife Service (NPWS) – the latter body on account of its role in the implementation of the licensing and inspection of zoos regulations and being the CITES Management Authority of Ireland,” he said. Minister Creed said his department will continue to engage with stakeholders in order to ensure compliance with animal health and welfare of all animals. However, he said that under Section 25 of the Animal Health and Welfare Act 2013 there are certain codes of practice that must be adhered to. While he said the use of animals in circuses is under constant review, the information he has to hand indicates “there are in fact very few wild animals currently in Irish circuses and I have no plans at this time to ban the use of wild animals in circuses”. 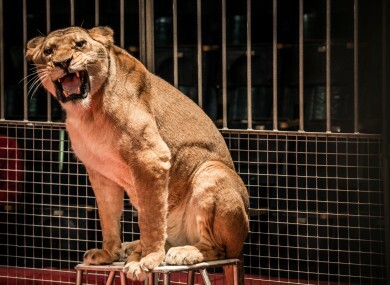 Earlier this year, one of Ireland’s most prominent animal charities renewed its call for a ban on animal circuses after a protest turned violent in Dublin. The ISPCA launched its ‘Big Stop’ campaign calling for a total ban on animal circuses in Ireland. It said the attractions “serve no conservation purpose and fail to educate their visitors about the animals used by them”. This evening, a motion calling for the use of wild animals to be banned in circuses on council land was passed by Dublin City Council. Email “Government says it has no plans to ban the use of animals in circuses”. Feedback on “Government says it has no plans to ban the use of animals in circuses”.